Slide your back down the wall by slowly bending your knees. Don’t let your knees go past your toes. Let the knees point in the same direction as your toes. As you come up, focus on tensing the muscle above your knee and your buttocks. Sit up straight on a chair. 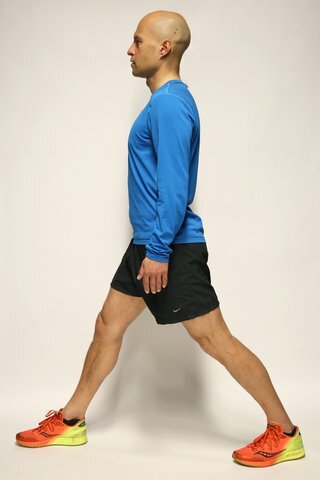 Slowly straighten and raise your right leg until straight with your foot pointing slightly outwards. Squeeze your right thigh muscles and hold this position for 15 seconds. For the exercise to be effective, you should keep tensing the muscle above your knee. Repeat with the other leg. Sit up straight on a chair. Straighten and raise your left leg until horizontal, with your foot pointing slightly outwards. Keeping your leg raised, move your leg up and down 10 times while maintaining the contraction in the muscle above the knee. While doing this exercise, do not let your raised foot touch the floor. Repeat with the other leg. Sit on the edge of a chair. Keep your right leg bent and straighten your left leg, placing the left heel on the ground with your foot pointing slightly outwards. Bend towards your left leg to stretch your hamstring while tensing the muscle above your knee at the same time. Repeat with other leg. To stretch your right ITB, cross your right leg behind your left leg. Keeping both feet on the ground, lean to your left side and push your right hip outwards. Tip: don’t bend forwards or stick your buttocks out. You should feel the stretch along your outer right thigh and hip. 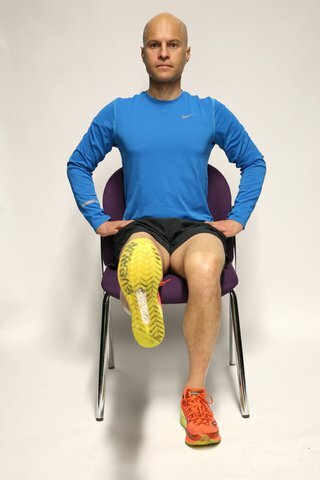 Stand with your feet shoulder-width apart, feet pointing slightly outwards and your hands down by your sides or stretched out in front for extra balance. Lower yourself by bending your knees to no more than a right angle. Keep your back straight and don’t let your knees go past your toes. 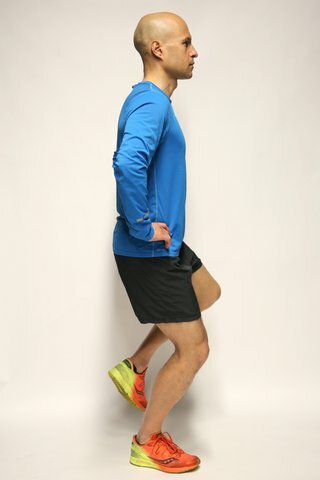 Stand with both feet pointing forwards, hip-width apart. Lift your left foot off the ground and balance on your right foot. Now bend your right leg and slowly lower yourself, making sure your knee doesn’t go past your foot or lean inwards. Push back up slowly to your starting position. Stand with your feet pointing slightly outwards. Shift your weight onto your right leg and lift your left foot off the ground. Now bend your right leg and slowly lower yourself, making sure your right knee points in the same direction as your right foot. Push back up slowly to your starting position, keeping your thigh and buttock muscles tight. Tip: don’t let your knees extend over your toes. Slowly bend the knees, lowering into a lunge until the right leg is nearly at a right angle. Keeping the weight on your heels, push back up to the starting position. Keep your back straight and don’t let your knees extend over your toes. New to running? Couch to 5K gets you off the sofa and running in just nine weeks. The One You Couch to 5K app gives you a choice of running coaches and helps you track your progress. Download the One You app now.